StartIsBack returns Windows 8 a real fully featured start menu and start button, behaving exactly like the ones in Windows 7. It radically improves desktop usability and makes new Start screen clutter-free. It is fully native lightweight zero-privileges program, cheap and fair, fast, stable and secure. Been using this on 8 and really it's pretty much the start menu from 7. Hard pressed to tell the difference, but with a few extras in configuration... Very nice, lean running. Great. Been using this gem since it's early days, the best for win8 to bring start back. I started using this on windows 8 (64bit) since it was a beta and love it. I tried all the others and always came back to this. I like that it doesn't add any new running resources like almost every other program does. I recently started using the alpha version when I installed windows 8.1 Pro Preview and am now using StartisBack Plus RC2 on my 8.1 install. It works great! You cant beat the price and Tihiy , the creator, really works with those in the beta testing to make this the best it can be. I still don't use Windows 8.x - I prefer 7 Pro 64 bit. BUT, for those that do, like some buds of mine, this program looks really good. Very close to the original in Win 7. Gotta love that. Love it for $3 for 2 licenses. Not sure why one would be willing to save $3 and wait for another 6 months for some realization of this function in Windows 8.1. Good programme, does what it is supposed to do. $3 is a fair asking price for covering 2 pc's. 1. Start Menu 8 is free. This is not. 2. Wait for the 8.1 update to windows. It's free, this is not. 3. See items one and two above. Total waste of money and time. can't afford windows 7? 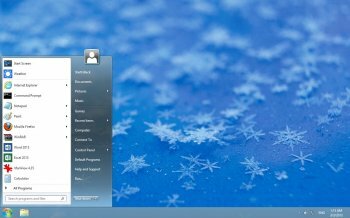 Zorin free linux OS looks like blindows 7 without the BS I use it myself and love it you can dual boot with it choose OS you want to run upon boot ...so it will run fine along side your windows operating system .. Probably the best of the Start Menu replacements for Windows 8. Hopefully will still work as well in 8.1 as Microsoft is still working hard on further crippling the desktop. @-Lord-: MS is only bringing back the Start Button, not the menus! The Start Button will simply switch you to the Start Screen. A waste of time and money. MS is bringing the start menu back in the 8.1 update along with the ability to bypass the metro/modern UI. Save your money and wait.